Anderson Lake House located on Long Island is the most desirable area of Hot Springs. On the island you will feel miles away, yet most activities are only minutes away. Stay to enjoy the lake and take an adventure mountain bike ride or hike the trails in the Northwoods. This home is a perfect getaway for family vacations, couples, retreats, golfing or extra wedding guests. Pets under 10 pounds and non-shedding allowed. Contact owner regarding your pet prior to reservation. Attending a convention? Stay on the lake. Anderson Lake House accepts eCheck or credit card payment methods. Each bedroom has a private full bath. Dining room is located off the kitchen and enjoy dining on the deck as well. Anderson Lake House has 2 large bedrooms, each with a king and the second also has a double. Each bedroom has a full private bath. There is a comfortable sleeper sofa in the living room with the lake view. The kitchen has granite counters, stainless steel appliances and is stocked with every thing you need during your stay. Each room has a gorgeous lake view across the entire lake side of the home. 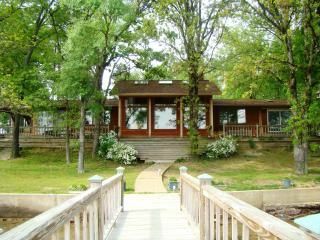 Enjoy the deck,which is the length of the home on the lake side, while relaxing on the outdoor furniture and bar-b-queing on the outdoor grill. Bring your boat to use the dock. Swimming is perfect off the seawall and a sturdy ladder makes it easy to get in and out of the relaxing lake with your raft. Internet is provided. We thoroughly enjoyed our visit and will be back!! I love this home!! Very relaxing and perfect for us to unwind. Cyndy is very kind and thoughtful, you really only need to bring food items and towels for the lake. Lovely spot to discover Hot Springs from. Perfectly located with great access to the lake. We were there for the races but would be great spot for a late spring/summer lake vacation. We had a quick family reunion weekend and stayed at this lakefront place. Convenient to Oaklawn and lots of restaurants. The house was wonderful. Really enjoyed morning coffee outside on the deck watching the ducks and boats. Great sleeping arrangements and lots of windows for lake viewing. Cyndy met us and filled us in on necessary info and answered questions. All in all a great time. Highly recommended. We had ourselves a wonderful stay in this beautiful home on the lake. We arrived on Thursday and was met by the owner to make sure we found our accommodations okay. Just as advertised, twin master bedrooms on bottom floor with a beautiful view of lake a few steps away was a nice bonus for seniors. We’ve been vacationing in hot springs once a year or more with the other couple for over forty years and due to location, accommodations,and owner this was our favorite place and will surely come again. We enjoyed our stay. The house has so many windows and skylights to enjoy the lake views and sunrise/sunsets that we just watched that and never turned on the tv! Our kids enjoyed seeing so many water fowl and song birds. We had dinner alfresco on the deck. What a lovely base to explore Hot Springs NP and the Oachita National Forrest. The host was sweet and quickly answered any questions we had. Many activities are close by or just relax on the lake. 2 minutes away are Back Porch Grill , the Hot Springs Mall, Kroger Grocery, boat rentals and mini golf. In the downtown area are the Hot Springs National Park, with great hiking trails and luxury-yet affordable- hot springs spas, art galleries including the American Art Gallery, Taco Mama restaurant, Rileys Art Glass Studio, Dryden Pottery, and Maxwell Blade Theater of Magic. The Mountain Valley Springs Company has a beautiful museum. Wonderful local churches welcome visitors. Hot Springs is very popular area for mountain biking and cycling as well. The Forest Path Gallery is very impressive for all ages and requires an appointment to visit. Great restaurants only minutes by boat from the lake house dock. Maps and coupons are provided for many of these most popular locations. Nightly Rate: $200 - $250 per night based on occupancy/season $100.00 cleaning fee SPECIAL Fall / WINTER / SPRING DEAL - Right Now: $175.00 - $200.00 per night based on occupancy Deposit required to make reservation Balance due on or before 2 weeks prior to arrival HOLIDAY AND SPECIAL EVENT RATES APPLY - MINIMUM 3 nights Required --- CONTACT OWNER Studio apartment available for 2 extra guests for additional fee. Contact owner for details.